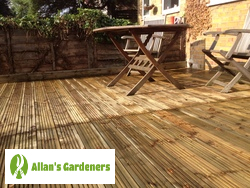 When you need professional help in re-designing or improving the style of your garden, get in touch with Allan's garden design experts in Walthamstow E17 today. We’re on hand to offer free advice and price estimates on any small or large garden design job you need helping with. Imagine the difference of having a newly laid patio or a freshly made, colourful border which will make your property more attractive? Our rates are extremely competitive, and because we provide a bespoke service based on your personal preferences, you'll receive exactly what you’ve asked for. Whether you're just too busy to do the job yourself or simply need professional advice to help you with the design, Allan's specialists have the skills and expertise to help you every step of the way using the best equipment on the market. Experienced garden designers that listen to you and tailor their design to perfectly match what you want and need from your outdoor space. We prefer to send round a landscaping specialist to discuss your ideas on site before we provide you with a final cost for the job. They will be able to give you their invaluable advice, and let you know whether your ideas are achievable and how long it will take to realise them. After this initial appointment you will receive your quote by email within 3 working days. 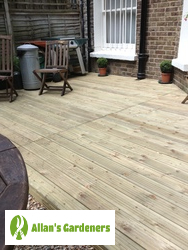 You can rely on us for your garden planning and landscaping because the team is well trained and experienced. They've been carefully selected and fully insured. We provide them with the best available materials and tools, and protect them from harm with the latest safety equipment. What Do Other Local People Hire Us For? Gutter Cleaning - leaving your guttering without the attention it needs for too long can seriously harm your property. Call in the experts today. Patio Cleaning - using powerful yet precise pressure cleaners, the team can spray dirt, dust, grime, and even in-grown weeds away from exterior surfaces. Garden Maintenance - get both regular and occasional help clearing up your outside space from a helpful team of local gardeners! Tree Surgery - high quality safety equipment, specially trained tree surgeons and all the right tools makes this the safe and easy local tree care solution. Lawn Care - high quality lawn care of all kinds is provided here. We offer both regular lawn mowing and trimming, as well as specialist aeration and scarification. For the convenience of our customers we provide a number of different ways in which you can make your booking, including online using our chat option or by completing a simple booking form. Alternatively, you can pick up the phone and dial 020 3746 3128 24 hours a day. You’re hiring multi-skilled garden landscapers who not only cater to Walthamstow E17 but also… Bethnal Green, Hackney, Enfield, Barnet, Harrow.